UCL Laws project with unique educational focus brings together Masters students, PhDs and Faculty, using a multi-layered feedback process to deliver cutting edge research. UCL Laws PhD and LLM (Master of Laws) students are assisting international non-governmental and inter-governmental organisations on some of the most pressing and challenging issues of our time. Through the UCL Public International Law Pro Bono Project (the Project) the students carry out cutting edge legal research under the direction of UCL Laws Faculty members, and provide analysis and advice to partner agencies in support of their human rights protection work. The Project began its life as a PhD and LLM student project, a marvellous reflection of the public spiritedness and initiative of the graduate Laws community. With the addition of Faculty support (principally consisting of Faculty direction, supervision, and responsibility for maintaining and establishing new partnerships), the Project has expanded and been given a firmer footing and a unique educational focus, while remaining absolutely committed to the collaborative group work ethos which gave rise to the Project. 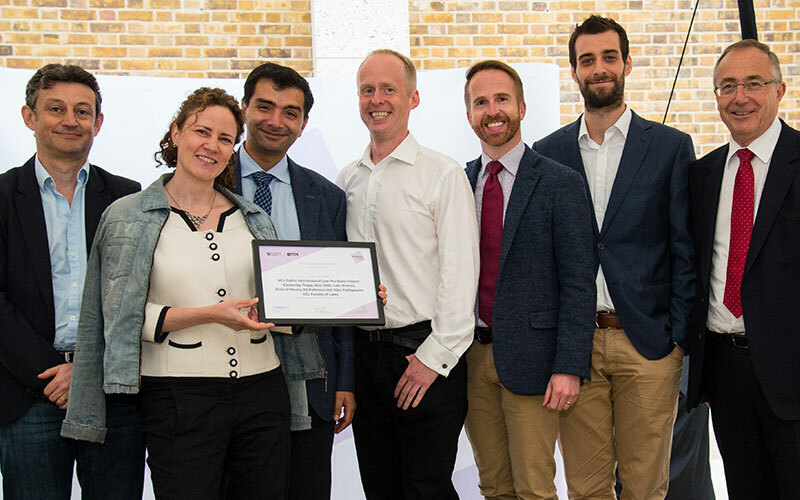 In 2018, in its first year as a Faculty supported project, the Project was awarded a UCL Education Award by the Provost. To enhance the learning experience of the LLM and PhD students by connecting their classroom learning to ‘real-world’ problems and developing their skills and knowledge in practice-led research – mapping the dimensions of the Connected Curriculum. To fully integrate Laws PhD students into Faculty teaching by developing their research supervision skills and linking their spheres of expertise to teaching and research outputs. To enable graduate students and Faculty, working together and using their collective expertise, to help address some of the most pressing and difficult global challenges – mapping the principal themes of the UCL 2034 strategy. The integral role of group work and the layers of feedback in the research process maximise not only the student learning experience, but also the quality and potential impact of the research. The Co-Directors of the Project, Kimberley Trapp and Alex Mills, explain further. "The Project is a pro bono enterprise. LLM and PhD students volunteer their time, on an extra-curricular basis, to assist leading non-governmental and inter-governmental organisations in their important human rights protection work. It is widely advertised to all LLM students at the beginning of the academic year, and the LLM student participants are chosen by the Co-Directors and PhD Coordinators through a selective application process. The research carried out by the Project is cutting edge and requires a solid foundation in international law, which is why participation is restricted to graduate students who already have demonstrable expertise. UCL Laws is delighted to welcome a cohort of diverse and exceptionally bright LLM students every year, and one of the privileges of such a pool of available talent is that we are enabled to assist international organisations and courts with their work. The LLM students are assigned to a particular research stream based on their expertise, experience and the focus of their studies. This is because there is a very important Connected Curriculum element to the Project (discussed further below - jump to this section). The Project has also worked with the World Refugee Council and the Syrian Legal Development Programme. Each research stream is headed up by a PhD Coordinator, and all streams are further supervised by the Faculty Co-Directors. The Co-Directors receive requests for research assistance from the organisations they are assisting, and work with those organisations to clarify the scope and focus of the requested research. An initial scoping meeting is held (with the Co-Directors, the PhD Coordinator responsible for the research stream, and participating LLM researchers) to set out the research project and the work required of the LLM research team in delivering the research to the requesting organisation. Directors and PhD Coordinators work together and draw on their research-led expertise in international law to frame the issues raised by the research questions, set the broad focus of the work, and direct the participating LLM researchers to particular resources which they might rely on in the course of carrying out the research project. Within the research streams, research tasks are assigned to individuals, pairs, or groups – a process which is largely managed through collective decision-making involving the researching students themselves. Students then work together to plan and carry out their research and to integrate their research work product into a draft, focusing on the needs of the organisation requesting the research. Throughout the research and drafting process, LLM researchers are in touch with their Coordinator and the Co-Directors to ensure an efficient workflow. This group work process is a very important feature of the Project. It ensures that PhDs learn from Faculty (the ‘how to’ of directing research) and that LLMs learn from PhDs and from each other through collaboration. The problem-focused nature of the research allows for experiential learning. PhD Coordinators and LLM students ‘learn by doing’ high level research supervision and practical research respectively. In addition, we regularly communicate with the organisations we work with and send through skeletal analysis for comment, adding an important further layer of feedback and co-operation with external partners. Faculty Co-Directors also expand the scope of their research interests through the collaboration with human rights protection stakeholders, PhD Coordinators and LLM researchers. Research is reviewed by the PhD Coordinators, who prepare feedback for the LLM student researchers with comments and suggested revisions in track changes. The Co-Directors then review this draft – providing not only further feedback to the LLM students, but also feedback to the PhD Coordinators on their feedback, enhancing the learning experience for students at both LLM and PhD levels. In particular, the LLMs learn how to better tailor their research to the needs of a particular organisation, while the PhDs further develop the essential skill of supervising research. A preliminary draft version of the research may also be sent to the relevant organisation for further feedback and guidance on the work required. Further research and redrafting is carried out by the LLM research team, with tasks allocated on the basis of the most effective way to utilise relevant student expertise and enhance students’ learning experience. Final revisions are made to the work product by the PhD Coordinators and Co-Directors, and a polished version of the research project is sent to the relevant organisation. A tracked changes version of this final document is also sent to the research team, so they can see any changes made in the final version with a view to helping them further reflect on their drafting skills and how to tailor analysis for a particular audience. UCL Laws’ public international law students develop the skills necessary for them to thrive in their future careers, whether this takes them into the world of legal practice, academic research, or policy making. In carrying out their research tasks, students are enhancing their understanding of the international law subjects they are studying at UCL by gaining real world experience of the way in which the legal issues they study in the classroom are reflected in current practical and policy questions. PhD and LLM students engaged in the Project are given a unique opportunity to gain awareness of some of the most difficult challenges facing the international community and of the important work being done to respond to those challenges, which may shape their future careers. They are also exposed to important human rights protection stakeholders, giving them experience of potential career opportunities. The Project also provides a particular opportunity for our PhD students to develop the skills of managing a research team, which are extremely important both in academia and legal practice. It further draws on the international law research expertise of UCL Laws Faculty members, enabling students to engage more closely with the academic work of the Faculty. Each research stream described below draws on subjects taught and researched by UCL Laws international law academic staff and PhDs, and enhances the learning experience of LLM students taking related academic subjects. Dimension one: Students connect with researchers (both Faculty and PhD) and with the institution’s research. Dimension three: Students make connections across subjects and out to the world by being assigned to a particular research stream based on their expertise and the modules they are studying. Dimension four: Students connect academic learning with skills for the workplace, particularly in applying their module learning to real world legal problems through collaborative research. Dimension five: Students learn to produce outputs – assessments directed at an audience. Dimension six: Students connect with each other, across phases. The Project has been transformational in terms of the student experience and learning within the Faculty. The Project enables graduate students and Faculty, working together and using their collective international law expertise, to make a positive contribution to addressing some of the most pressing human rights and security challenges facing the international community. Our LLM students include some of the brightest law students from across the globe, and bring with them a variety of expertise and experience. Many will have been educated in a foreign legal system and will have gained practical experience as a lawyer or policy maker before studying for the LLM. Our PhD students are an extremely select group of immensely talented and bright individuals, with a further range of expertise and experiences. The Project connects LLMs, PhDs and Faculty, and gives us the opportunity to tap into this incredible resource to provide practical solutions to some of the major legal and policy problems facing the international community. As a result, the Project is an impressive showcase of UCL 2034, both being driven by the highest traditions of public service in academia. Academic leadership: reflected in the commitment of the Co-Directors and Coordinators to public international law and international human rights law as part of the solution to global challenges. This commitment serves as the foundation for the contributions that UCL Laws and the Project make to human rights protection through its research. Integration of research and education: the Project provides an inspirational student experience, both for LLMs and PhDs, who are applying their UCL learning to research outputs in service of international human rights protection. In this practice led research, the Project equips graduate students with the knowledge and skills they need to make important contributions to the international community. Global challenges: the Project exemplifies UCL’s institutional commitment to providing solutions to global challenges, in particular international human rights and security challenges facing the international community as a whole. We are supporting the important human rights protection work of non-governmental and inter-governmental organisations through cutting-edge research. Accessible and publicly engaged: the Project brings together a diverse group of talented graduate students who, together with doctoral students and Faculty, are committed to the highest traditions of public service in the legal profession. Through our collaborative model of work, the Project creates a community of scholars who support each other’s teaching and learning, all with a view to achieving humanitarian outcomes. London’s Global University: the Project cooperates with partners in London and around the world, producing cutting-edge research in service of human rights protection – a model of UCL’s transformational impact and global reach. Delivering global impact: In addition to the learning and student experience outcomes, the Project is a clear exemplar of a research initiative aimed at delivering important human rights outcomes with impact for the international community as a whole. The Project is privileged in its collaborations, all of which are exceptional in their commitment to human rights protection. The Inter-American Court of Human Rights (‘IACtHR’) is the apex of the institutional framework aimed at protecting human rights in the Americas, and its decisions have a profound impact on the day to day lives of the victims of human rights abuse, as well as setting some global precedents in ensuring respect for and enforcement of human rights. The Project has a unique co-operation agreement with the IACtHR, producing cutting edge research memos on novel and difficult legal issues put to us directly by the Judges of the Court (most recently in respect of the very controversial pardon of former President Alberto Fujimori in Peru). The Project also submitted an amicus brief to assist the Court in respect of Ecuador’s request for an advisory opinion on asylum. Student research participants have written on issues which are grounded in their human rights law studies at UCL Laws, but which require them to apply that learning to difficult cases before the Court – writing from the Judges’ perspective and learning the essential skill of drafting for a particular audience. The impact of the Project’s work will be evident (albeit without attribution) in the judgments of the Court. The quality of our work and our contribution to the Court’s work is further evidenced by their continued requests for research assistance. We have worked in collaboration with the newly formed World Refugee Council, a non-governmental organisation established by leading global policy makers (including several former leaders of national governments and a Nobel Peace Prize winner). Students prepared a detailed report for its Executives, setting out innovative ways of unlocking the frozen assets of refugee creating regimes with a view to responding to the global refugee crisis, focusing on the international and domestic legal regimes governing assets frozen in the UK. The report will form the basis of the Council’s action plan in respect of the rules governing the treatment of such assets in the UK, both in lobbying Parliament and the UN Security Council. This innovative research required students to write for a sophisticated audience with a mixture of legal and non-legal backgrounds, and to bring together what they were learning in various international law modules with the very real challenges facing refugees. The potential impact of the research in human terms (in improving the lives of the most vulnerable members of our global society) is tremendously exciting and, of course, incalculable. The Project is working with Redress, a leading non-governmental organisation committed to securing justice for survivors of torture, combatting impunity for governments and individuals who perpetrate torture, and developing and promoting compliance with international human rights standards. The Project is assisting in the preparation of a report that Redress will submit to the UK Parliamentary Joint Committee on Human Rights, in respect of its Inquiry on the Human Rights Act (‘HRA’). The Project’s work will also feed into the shadow report that Redress is preparing for the UN Committee Against Torture on the UK’s compliance with its obligations under the Convention against Torture. The research being carried out by the Project has several aspects. It includes researching and analysing the most important HRA cases before the UK courts and the European Court of Human Rights, insofar as the prohibition of torture is concerned. This analysis goes beyond the immediate legal significance of each decision and its reception in academic scholarship, tracing the impact of the chosen cases on the development of the law in the UK and more broadly the Council of Europe. This includes setting out the broader social, legislative and academic impact of these cases – in particular the extent to which each decision has fed into public debate on torture, as well as any legislative and policy shifts which the cases have catalysed.